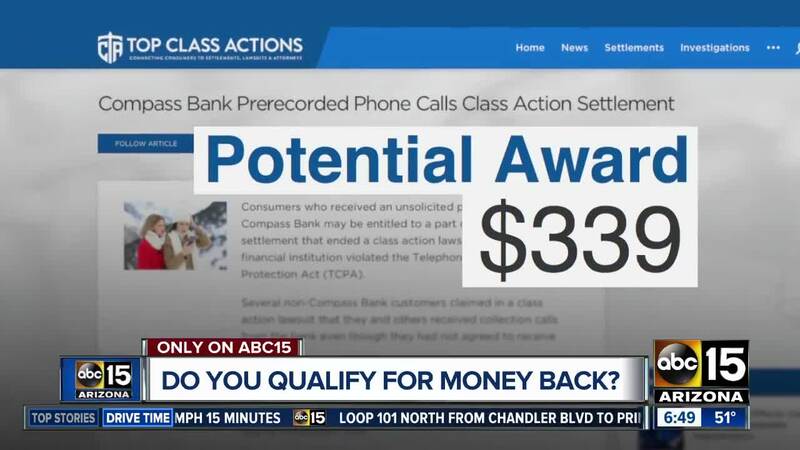 Cars, computers and Compass Bank lawsuit settlements: Do you qualify for this money? Chances are you own something with a lithium-Ion battery. It could be a computer, game console or cordless power tool. If you bought it between January 2000 and May 31, 2011, you could get part of a $64 million lawsuit settlement involving alleged price-fixing. PHOENIX — Chances are you own something with a lithium-Ion battery. It could be a computer, game console or cordless power tool. If you bought it between January 2000 and May 31, 2011, you could get part of a $64 million lawsuit settlement involving alleged price-fixing. The businesses did not claim any wrongdoing. The deadline to file a claim is January 18, 2019. Click here for more on this settlement. Another lawsuit alleging price-fixing involves makers of many auto parts used in new cars and sold at dealerships. It involves more than 2 dozen parts in vehicles and sold separately since 1996. The businesses claim no wrongdoing. The deadline to file a claim part of the $115 million settlement is January 21, 2019. And if you got a collection call from Compass Bank, you could claim some bucks. Allegations are customers got unsolicited calls from Compass and that the company used an auto-dialing system to cell phones. That would violate federal law. The $5.8 million settlement is for calls made between June 21, 2014 and August 24, 2018. The business claims no wrongdoing. The deadline to file a claim is January 21, 2019.